I am a firm believer in self-care. Yeah, our bodies and minds can be more than annoying sometimes, but they're constantly working and they deserve to be looked after. You deserve to be looked after. I'm telling you even if you disagree, so there. 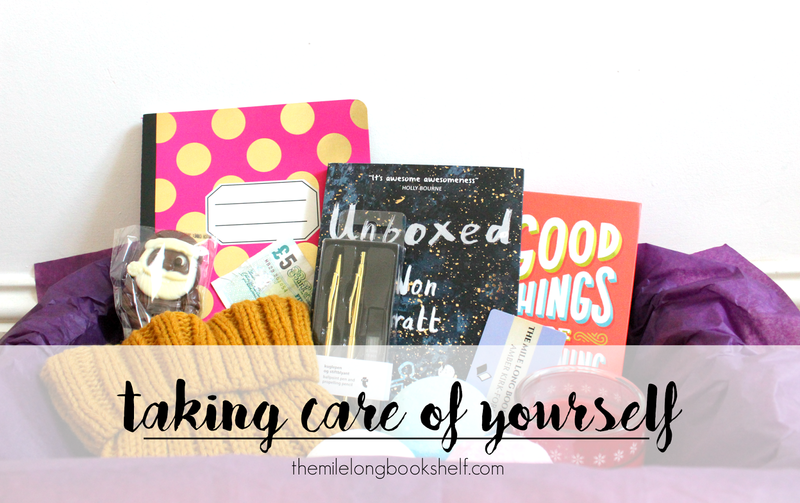 ...some other things you could include are: photos of friends/family, a face mask, any sweet letters/cards/notes you've received from loved ones over the years, maybe even a letter from yourself. Let's start with the books, which is always a good place to start if you ask me. 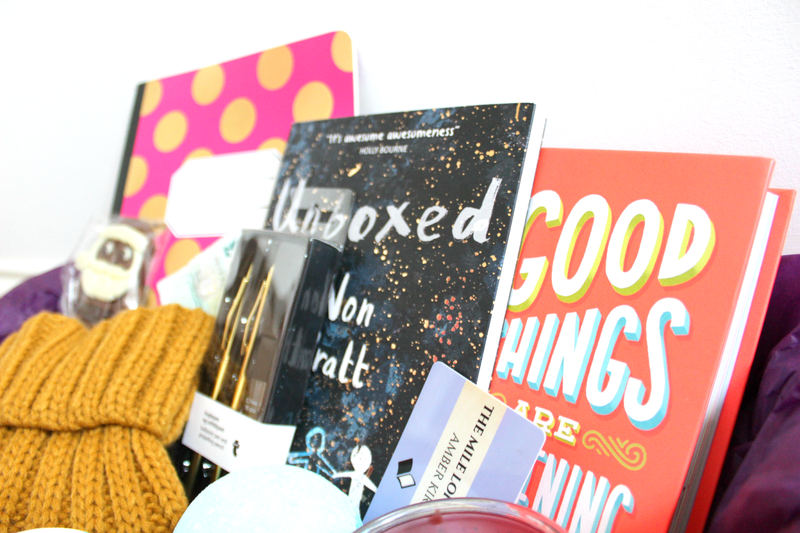 Unboxed by Non Pratt is a beautiful short story that can be read within an hour, and it's the perfect book to lose yourself in when you're stressed and in need of some escapism. Good Things Are Happening is a gratitude journal which asks you to note down three moments of joy from the day you've just lived. They don't have to be big, and it's nice to collect the lovely but small moments that you might have forgotten about otherwise. I like that it makes you actively seek out the positive things from what you might feel has been a bad day overall. While you're escaping or reflecting, you can't go wrong with a candle and a Lush bath bomb (or several). 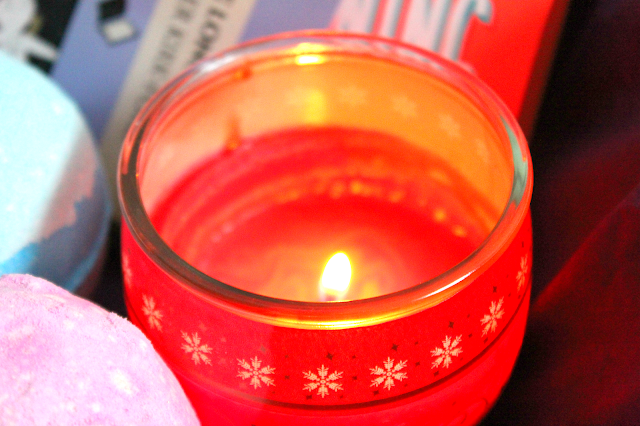 My favourite candle is the Apple and Cinnamon one by Glade, which I picked up in Tesco for £4 when I had a surprise guest and wanted the place to smell like I'm a well put-together baker extraordinaire. I only got it a week ago and it's nearly gone, which is sad, but it smells SO DELICIOUS. 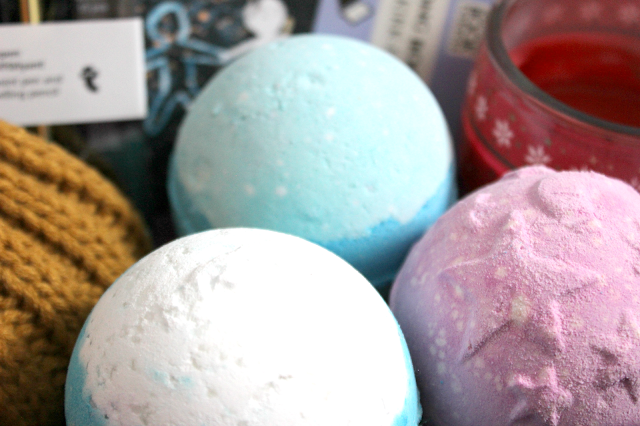 As for the bath bombs, the ones pictured are Twilight, Frozen, and Big Blue. My favourite and the one I find most effective for de-stressing is Twilight. 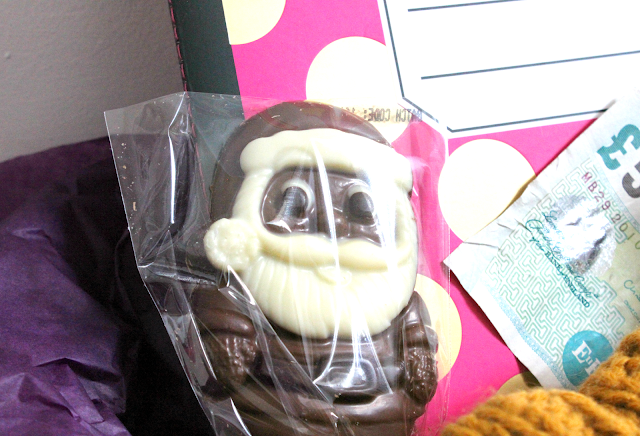 The chocolate speaks for itself, really. It's good. It's been scientifically proven to improve your mood. It can fight off dementors. Case closed. Now, the money and the book token... they might sound a bit random, but hear me out. Have you ever been tidying your room, or digging in the pockets of an old coat, and found a tenner? It's the best feeling, am I right? Of course I am. So you tuck some money in your stash of niceness and forget about it, and then you'll find it when you really need cheering up. Same with the book token. If anyone wants me as a life coach, hit me up and we'll talk. If you're the kind of person who needs permission for this kind of thing, I'm giving you permission to go and treat yourself ASAP. Why shouldn't you have nice things? Are you a bad person? I doubt it, and even if you are, Donald Trump probably buys himself bottles of blood from unsuspecting victims posh watches or whatever with absolutely zero guilt, so if he can have nice things, so can you. I've seen the One Line a Day diary, it looks good! Don't think I'd be able to keep up with it though. What a perfect selection of goodies. Everyone should give themselves permission to treat themselves. Self care is so important. You have no idea how much I needed to read this! Thanks for such a vital reminder! I have something similar to this. 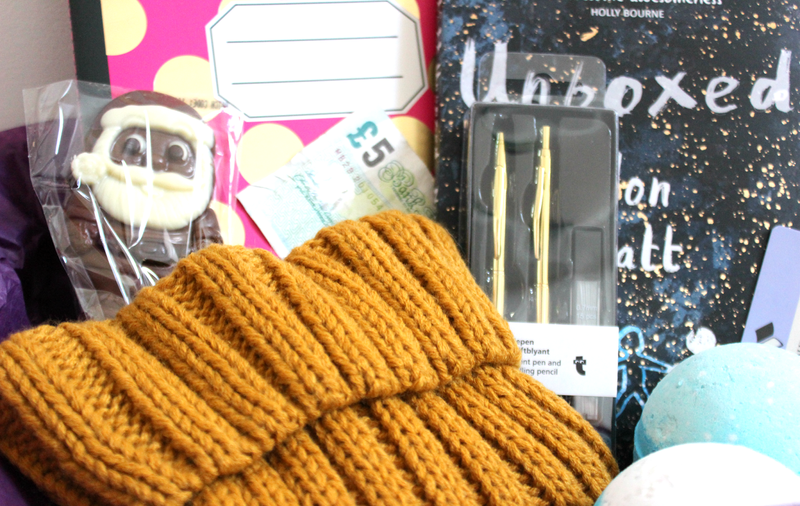 I call it my "happy box" and it contains many of the above things: emergency chocolate, little funny and positive books, a scrapbook of pretty and inspiring things, a candle, tea, and some postcards, as well as a cheerful scarf with sunflowers printed on it.